To begin her final season as Artistic Director of Ten Thousand Things, the company she founded over 25 years ago, recent Ivey Lifetime Achievement Award winner Michelle Hensley has chosen the Greek classic Electra. This 2000+ year old story of betrayal and revenge is clearly and succinctly told in not much more than an hour, and like all TTT shows, feels both fantastical and grounded in reality. With guest director/adapter Rebecca Novick out of San Francisco, seven of the top #TCTheater actors, a warm and wonderful Peter Vitale musical soundtrack, and very little in the way of usual theater magic (except that created by the skills of the performers), this tragedy is a joy to watch. I knew nothing about this play going into it, but the names and stories started to feel familiar from a long ago class about Greek mythology. 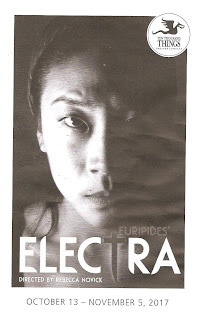 Electra was the daughter of Agamemnon, hero of the Trojan War, and Clytemnestra, who was understandably upset with Agamemnon after he sacrificed their daughter to the gods. So she took a lover, Aegisthus, and they killed Agamemnon upon his return from war. Electra and her brother Orestes were sent away, but years later they got their revenge, which is when this story takes place. The siblings reunite, and form a plan to kill the two people who killed their father, including their own mother. But revenge is never as simple or satisfying as that. Violence begets violence; Electra and Orestes are simply pawns in the curse on their house, continuing the never-ending circle of violence. Oh those wacky Greeks and their even wackier gods, ancient stories that still speak to us. 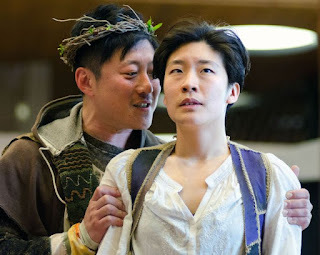 This lovely, talented, and diverse cast includes Audrey Park in the title role, so strong and heart-breaking; an equally strong Kurt Kwan as her brother Orestes, creating a believable sibling bond; Mikell Sapp as Electra's good and kind peasant husband; Ricardo Vazquez as Orestes' pal Pylades whom I wish we got to see more of; and last but not least, the delicious chorus consisting of Karen Wiese-Thompson, Thomasina Petrus (get there early for a pre-show mini-concert), and Michelle Barber, who all provide a bit of humor in their interaction with each other and the characters, and play other roles as well. I'm still obsessed with Trevor Bowen's reconstructed patchwork costume design (see also Pericles), with clothing that feels fantastical but built out of our very real world (just like what TTT does). Bits of pants and shirts cut apart and sewn back together in interesting ways with fun print matching and intriguing shapes - obsessed. Theresa Akers' set design is minimal but effective - a yoke that converts to a bench or table, a creepy looking head on a spike, and a tree with crowns used by the chorus to explain the backstory. I can never recommend Ten Thousand Things highly enough. What they do is truly unique and always entertaining, engaging, and powerful. Michelle Hensley will be greatly missed, but hopefully she taught us well enough to carry on the movement that she started 25+ years ago, a movement that seeks to include everyone in the audience. We have learned through working with her, reading her book All the Lights On, and/or experiencing her work as an audience, and her legacy will remain. Electra continues through November 5 at various locations around the Twin Cities, and Michelle's final season continues with the Kira Obolensky original Park and Lake, and the play that started it all - Bertold Brecht's The Good Person of Szechwan (which you can bet won't be 3+ hours long like the last time I saw it).